Crosley RSD3 is a limited edition 3-inch turntable for Record Store Day 2019 | What Hi-Fi? 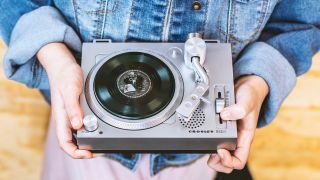 We've got some more info on Crosley's dinky little 3-inch deck, a special record player launched just for Record Store Day 2019. It's called the RSD3, and will be available exclusively from select participating Record Store Day shops this Saturday, 13th April. Which ones? You'll have to call up your local shop to find. Here's a list of participating stores. We're still waiting on a UK price. but in the US, it will cost $70. The deck has been a year in the making and marks the fifth time Crosley has created the official turntable of Record Store Day. The unit was inspired by the Japanese 8ban format. It's a belt-driven turntable, with an AT3600 moving-magnet cartridge, adjustable pitch control and built-in speakers, making it perfect for playing on the move. It has a fully supported platter, and an aux out port with an RCA adaptor for plugging in some bigger speakers. It plays 3-inch records and comes with a special copy of Big Me by the Foo Fighters. But that's not all you can play on it. There will be a string of similarly dinky releases by independent record labels, for Record Store Day itself and throughout the rest of the year. These include Bad Religion's My Sanity, Rancid's Ruby Soho, Culture Abuse's Dip, The Interrupters' She's Kerosene, Jack White's Love Interruption, The White Stripes' Candy Cane Children, The Raconteurs' Store Bought Bones and The Dead Weather's Be Still. Record Store Day 2019 takes place this Saturday, 13th April, with participating stores all over the world. To celebrate, we've put together a whole week of features and reviews.